^ a b "CFL holds combine in Mexico City in effort to grow football worldwide - Sportsnet.ca". www.sportsnet.ca. Retrieved 2019-02-05. ^ January 14, Dan Ralph · The Canadian Press ·. "Eskimos select Diego Jair Viamontes Cotera with historic 1st pick in CFL/LFA draft | CBC Sports". CBC. Retrieved 2019-02-05. ^ "CFL reaches agreement with French American Football Federation". CFL.ca. 2019-02-05. Retrieved 2019-02-05. ^ January 31, The Canadian Press ·. "CFL forms strategic partnership with German league | CBC Sports". CBC. Retrieved 2019-02-05. 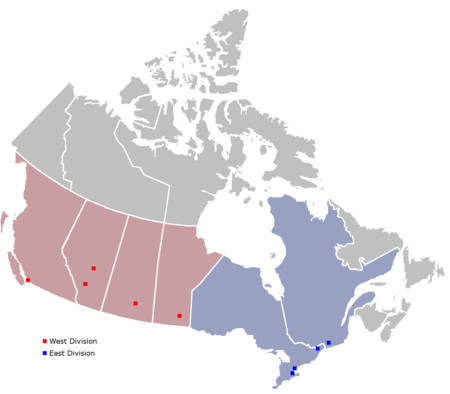 ^ "Name Game: Potential tenth franchise to be named Atlantic Schooners - CFL.ca". CFL.ca. 2018-11-23. Retrieved 2018-11-24. ^ "U.S. fans with cable will have to pay $5/month more to watch the 68 CFL games on ESPN+". Awful Announcing. 2018-05-24. Retrieved 2018-11-25. 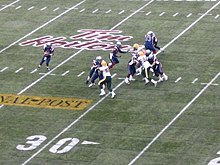 ^ "CFL 2017 season to be livestreamed in more than 130 countries". CFL.ca. 2017-06-16. Retrieved 2018-11-25.